Thanks to Steve Dubya for the image! I don’t really like graphic violence or gore. I don’t really like Cthulhu gaming. But I do like creative monsters, and I do want a way to make those monsters in my game. Creatures that shock and confuse my players, forcing them to think about how to defeat and perhaps injecting the fear of the unknown (or at least poorly understood) into their alpha-gamer souls. 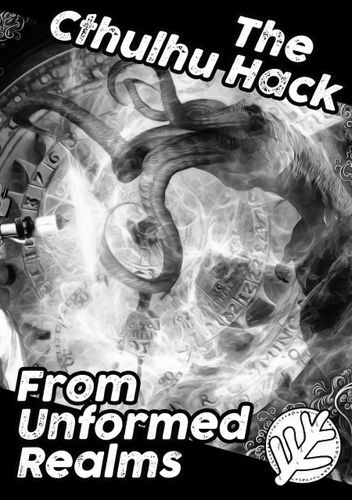 From Unformed Realms, nominally a supplement for The Cthulhu Hack, is a tool to achieve at least part of that goal: a simple but detailed system for creating “horrific” and otherworldly monsters. But it’s nearly systemless - just a long list of ideas for charging up your monsters. As a fantasy gamer, I didn’t expect this to work for me - but I was pleased to find that From Unformed Realms is a great tool for any game that needs weird and malevolent opponents. Caveat: I received a complementary copy of this pdf, along with The Cthulhu Hack, in exchange for reviewing the latter. I’m not sure if I was supposed to review this one as well, but after reading it I couldn’t resist! From Unformed Realms is a 19-page pdf, plus the cover in a separate file. The pdf is A4 size but oriented in a landscape format, with two wide columns of text. It has no interior illustrations and is nearly black-and-white; only the page numbers and a sidebar have any color. It’s nicely laid out and easy to read, and the editing is excellent (just a couple of trivial typos). The primary component of the booklet is a systemless random monster generator, which spans about 14.5 pages. It is a nested d6 table: roll a d6 to determine the category (extremities, skeleton, etc. ), and then roll another d6 to determine the feature itself (spinal mutations, etc.). Often there’s a third d6 to roll for specifics (like which kind of mutation), and maybe an extra table to consult (for the effects of the fluids spewed out by that mutation, for example). However, this isn’t arranged as a stark list of keywords. Instead, it can be read, more or less, as a narrative. The categories are headers, and the sub-rolls lead into paragraphs, full of evocative descriptions of the various features. Kaleidoscope - The entity communicates through a complex light display, flickering pinpricks like a swarm of fireflies conveying a wealth of information. The entity may have keen vision, but also might have a specialized receptor – like a large Cyclops-like eye or a gem-like extrusion in the flesh of its torso. What I love here is the flow from the abstract to the specific. That’s great in a random table, because in practice you can stop wherever you want in the process. If Senses-Voice-Kaleidoscope is enough for you, the detail is irrelevant. But if you want more inspiration, it’s there: clearly and evocatively expressed. There are a ton of ideas, many I hadn’t considered (though to be fair that may be because I have little experience with Cthulhu games). These monstrous elements are, for the most part, centerpieces - that is, nearly all of them could be the most memorable component of a new monster. That’s really, really cool. I’m used to monsters having a bunch of throwaway descriptive elements that help build a picture but ultimately don’t matter. Orcs look like pigs, gnolls like dogs, etc. There’s none of this “fluff” here - or, rather, all the fluff has consequences. That helps you build monsters from the core outward and is a really effective way to seed inspiration. Flares or flash bombs blind the chatter and cut off all communications, possibly temporarily overloading any specialized receptors as well (although even horrors of animal intelligence will get wise to this tactic and ‘close’ their eyes, cutting their chatter, when in the presence of pesky meddling prey). In an old-school game (like The Cthulhu Hack), it’s up to the players to position themselves fictionally to trigger this weakness; in many modern games, you amy want some way to define those triggers within the rules framework. Even more importantly, many of these powers provide offensive capabilities, which - since they affect the well-defined characteristics of the PCs - are crucial to define in some way. For this reason, I think From Unformed Realms pairs best with either a rules-light system (for which such distinctions are unimportant) or one with simple, modular monster creation. For example, 13th Age would work well: while certainly a complex game, it provides baseline stats for monsters at different levels and a huge array of mechanics from which to choose for specific effects. The advantage of the systemless approach is that the results are applicable to any monster power level and base creature. That’s a powerful idea: suppose you want a new and unique monstrous humanoid for your D&D game. Roll or pick a couple of these abilities, and you’ll have a twisted version of the humanoid, maybe with spinal spikes and frothing acidic blood. Not too weird, but enough to stand out for sure (certainly more than the prototypical orc). The book recommends making one roll per hit die of the creature (at least within The Cthulhu Hack rules), which is a nice way to crank up the weirdness with power. One final note: a portion of this is “adult” content - while most of it suggests gross and sometimes graphic horror, it also includes reproductive elements, shall we say. They are easy to ignore if that isn’t part of your game, as is some of the more graphic description, but this doesn’t shy away from such content. From Unformed Realms includes “the obligatory appendix” (in its own words) to provide adventure frameworks for using the monsters you generate. It’s a very simple system made up of tables (of course) - only this time, they really are tables, with just a few words per entry. It’s basically a Mad Libs system: a framing sentence and then tables to fill in the blanks. It’s fine - it’ll give you a one-sentence motivation for an adventure, as promised. But it’s not nearly as compelling as the monster section itself. From Unformed Realms was a very pleasant surprise to me. I expected a drier set of tables more focused on Cthulhu - instead, it’s an evocative and easy to read source of inspiration for just about any otherworldly monster. I like how it cuts straight to the weirdness - horrific or simply dangerous - and lets you build the monster around those core abilities. I fully intend to use this in fantasy games - at least high-fantasy ones, where “realism” isn’t a concern. The primary caveat is that the tables are systemless, providing virtually no mechanical detail for the inspiration contained within the table. But if you have either a rules-light system or one tuned to customize monsters, this is a great beginning point for your monster creation. Thanks for a fantastic and thorough review, Steve. I really appreciate it.